I'm piecing together a cable management system with a RIGrunner 4005H at its heart. I'm mounting it under a Losmandy-style plate. What I'm wondering about is powering it. I have a pair of 12v 35 amp hr Mighty Max batteries for out in the field. But what about when I'm just out in the yard? I'm looking at 120v AC to 12v DC transformers. Since the RIGrunner 4005H is designed to distribute up to 40 amps, should I choose a transformer that produces 40 amps? My iEQ45 Pro and my USB hub each use 2 amps, and my ASI1600MM Pro cooler uses up to 5 amps. Is a 40 amp transformer overkill, or do you think that this would be a smart move? I'm note quite sure how to calculate what I really need here. You won't be pulling anything like 40 amps, although it doesn't hurt to have an oversized DC power supply (transformers are AC). A 20 amp supply is probably plenty. I assume that you'll have an extension cord when you set up in your backyard. This power supply should work fine. I would put a plastic tub over it for dew prevention though. This is the power supply I use for my 4008H, http://www.westmount...ucts_id=ss-30dv . It’s been in some rather harsh conditions for two years and is still plugging away. Use silicone jacketed wire to get from the power supply to the Rigrunner. It has the stiffness of cooked spaghetti. Thanks for the feedback and suggestions, guys. Frankly, I'm looking for something a little more economical. 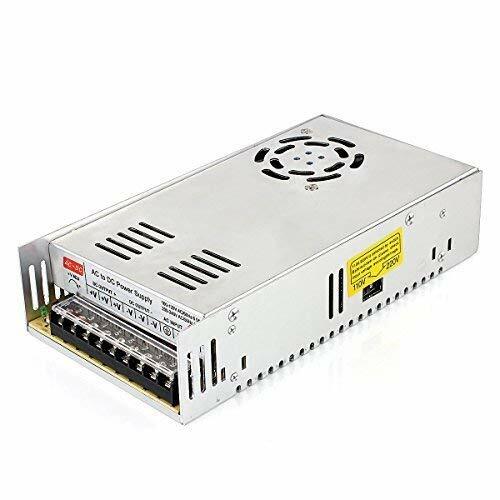 Do you think that this 12v 30 amp power supply should work? It's all of $18 by EPBOWPT, but the reviews from ham operators who've been using it are largely positive. Edited by AZJohnnyC, 14 February 2019 - 06:40 PM. I got one from Amazon, it powers al, three of my mounts at the same time plus my laptop. It’s 15 amps. Just plug it into the ac then add a cigarette lighter style plug with a splitter. I made some cables myself to split it out to everything I want to power. Three mounts, laptop and camera. Not sure how much power you need though. If you can find one (power supply) that delivers 40 amps, and fits your budget, go for it. It will be less likely to have a voltage drop with higher loads applied to it. The Rig Runner is set up so that the input must have a fuse that is equal to, or greater than the total of all output circuits you're running, and each output circuit has its own fuse for the current that circuit will draw. So, the 4005 has 6 connections, 1 input and 5 output. You can run the input into any one of the connections (even though the one at far left is designated as input on the front of the panel), and all the others will draw their current through that one. Each channel that is further away from the input will get less than the channel nearer to the input if you have something connected to the close ones. Rig Runner recommends running the higher drain circuits closest to the input. I have a 40 amp fuse in my input channel, which I am using on the right end; the two channels to the left have 10 amp fuses, and the furthest three have 5 amp fuses, for a total of 35 amps. I've found that I can probably drop to a 7.5 amp fuse where my 10's are, so I could probably drop the main fuse to a 30 amp fuse. Right now I'm running my mount and dew heaters through the Rig Runner. Current draw is additive, so if you know what each of your accessories uses, just add it all together to get the minimum you need to deliver. I'd add at least 20% to that number. For instance, my mount draws less than an amp when tracking, but as much as 4 amps when slewing. Dew heater current will vary with the number of strips you're heating and how much you have them turned up. Way too much is better than marginal or not enough. Edited by Luna-tic, 14 February 2019 - 08:16 PM.